The Ultimate Comfort Food: Mac and Cheese! 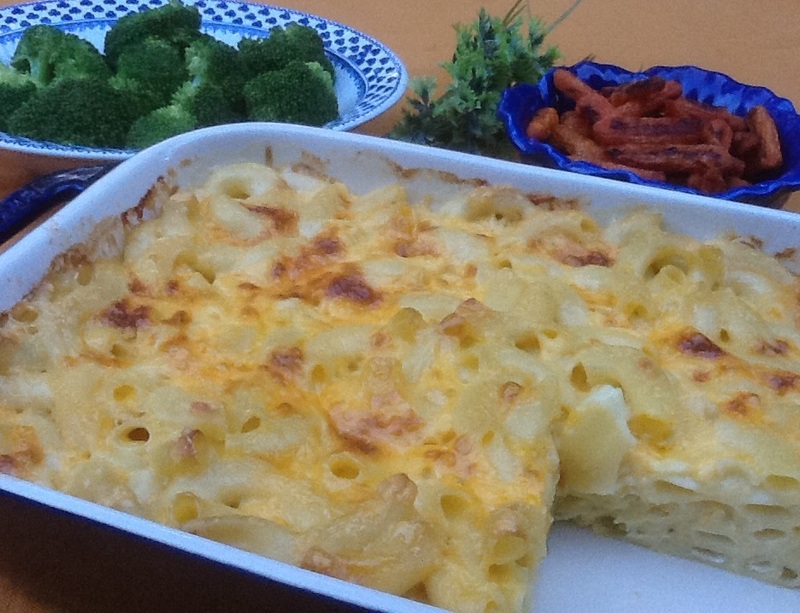 Homemade MACARONI & CHEESE, served with steamed broccoli and roasted carrots. Much to my children’s amazement, I was once a child myself. So I know first-hand that kids are creatures of habit. Example: If you give a child a cookie after dinner as a treat “just this once”, they will translate that to mean they will get a cookie after dinner “forever”. The battling will begin, and logic will never prevail because in their minds, they ALWAYS get a cookie after dinner. When I embarked on motherhood I was determined to make it as easy on myself as possible. So I made everything from scratch – baby food, bread, pasta, yogurt, soups, and macaroni & cheese. What’s that you say? Cooking from scratch doesn’t sound easy to you? First of all, it’s easier than you think – it just takes practice. Second of all, I would rather spend a few extra minutes preparing healthy food so my kids (aka, creatures of habit) were used to what ‘the real thing’ tastes like. I knew in time they’d eat packaged and fast foods, but I was hoping that by then they would find those foods (laden with sugar, salt, preservatives, and additives) abhorrent. Macaroni and cheese is standard fare to serve children. Sadly, most kids only know the boxed kind, with its fake, orange colored cheese. That’s all I knew growing up – my mother gravitated like a magnet to boxed, canned, and frozen foods. While she enjoyed good food, preparing it held little interest to her. If your history with macaroni and cheese is with the boxed kind, you may feel like homemade is missing something…and it is. Check out the ingredients list on the package and you’ll see what – and they’re all unpronounceable. Stick with it and you’ll learn to appreciate homemade macaroni and cheese. To cop the slogan from the old Coke commercial: it’s the real thing! Boil the pasta until it’s almost soft – it will continue to cook in the oven with the other ingredients. When pasta is done, drain and return it to the cooking pot. Blend in the butter and egg – do this on a cool surface (you don’t want to cook the egg). Transfer the pasta into a buttered 8″ x 8″ baking dish. Pour the milky cheese over the pasta, then sprinkle the reserved ½ cup cheese on top. Bake uncovered at 350º Fahrenheit for 45 minutes, until browned. This entry was posted in Main Dishes and tagged Bonnie Antonini, homemade mac & cheese, macaroni & cheese, pasta dishes, Vegetarian Cooking For Carnivores, vegetarian recipes. Bookmark the permalink.